Bangsar, June 8: To a newsman, a good day at the office is one that ends with the best stories making the front page of tomorrow's paper. 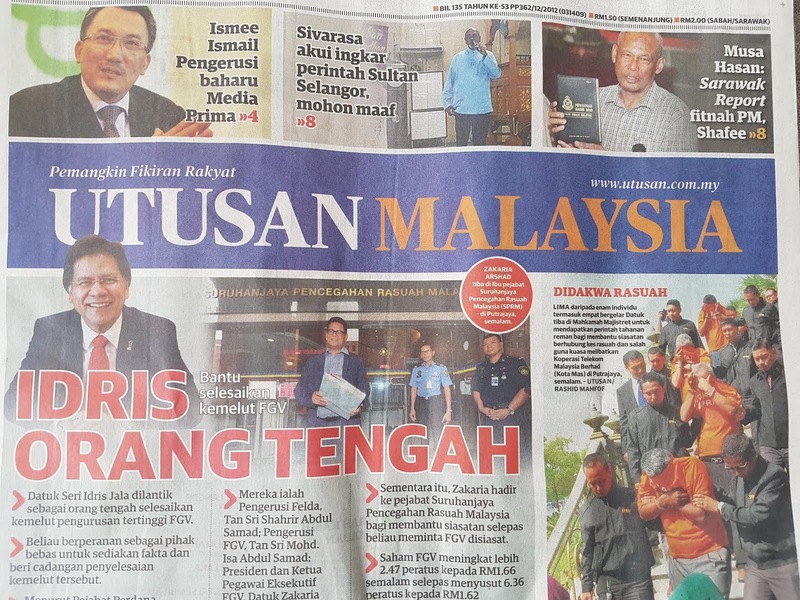 Today's Utusan Malaysia has that kind of front page: the FGV saga, a new Chairman at Media Prima, PKR's Sivarasa mohon ampun from Sultan Selangor, a former IGP exposing yet another lie hurled at 1MDB, and another major corruption bust by the MACC. 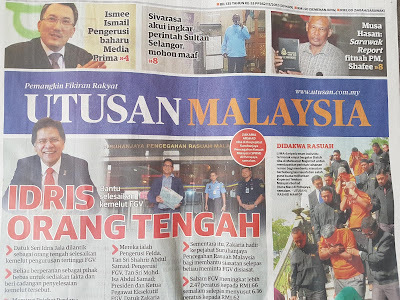 Notice the absence of political rhetorics on the front page of Utusan today ..
Incidentally, someone asked me last night if Idris Jala was the best person to help manage the leadership crisis in FGV. Look at Idris' track record when he was sent to troubled Malaysia Airlines and his work at Pemandu offering the Government cures for all kinds of the nation's ailments. Look also at the rebound of FGV shares prices, which reflects the market confidence in Idris. My view is that PM Najib Razak could not have sent in a better trouble shooter. Which does make me wonder, at the same time, what had made him put Isa at Felda and FGV in the first place! The Sarawakian's first task, if he asks me, is to tell both Isa Samad and Zakaria Arshad to shut up. Both men have said too much. Idris should also warn Isa not to threaten the Press, or anyone else, with lawsuits. This is not a family feud or a Negri Sembilan clan war. To make things easier for himself and fairer to all parties involved, Idris may want to ask Isa to go on leave pending his investigation/report. Can't ask him to resign, because in Isa's own, emphatic, words (which were exactly Zakaria's words): "I did no wrong". 1. Muhyiddin: Mengapa Idris Jala, bujanya firma akautan bebas? 2. Khairuddin: Adakah Idris Jala pakar menyiasat? Why these 2 Dins are busy body? Mind your own business.